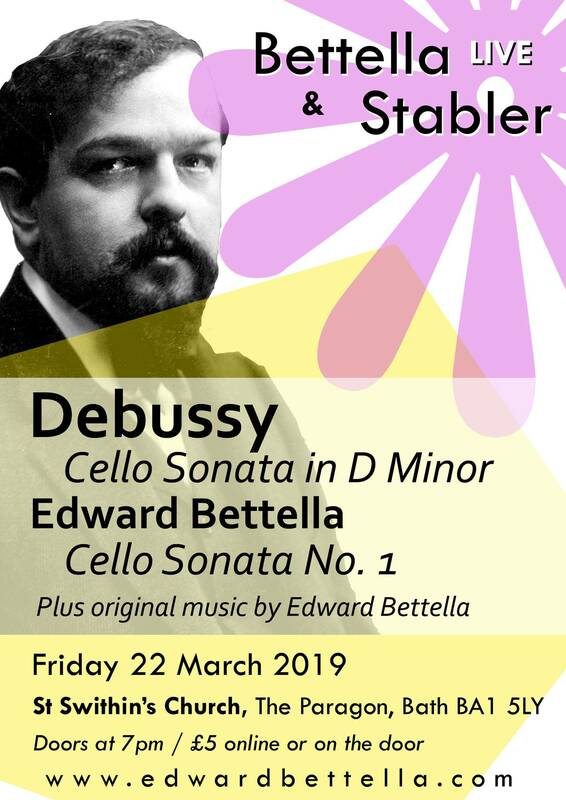 Join composer pianist Edward Bettella and cellist Jonathan Stabler for a performance of Debussy’s late masterpiece, Cello Sonata in D minor. Composed in 1915 this sonata displays Debussy’s full musical range, combining dissonance, rich harmony and pentatonic melodies that would have a far reaching influence on jazz and later modern music. This concert will also feature music by Edward Bettella including the epic Cello Sonata No.1, which had its world premiere last year. A modern piece of classical writing that celebrates the heritage of composition for cello and piano, Cello Sonata No.1 utilises a broad palette of tonal colour and timbre, with a wide range of techniques for both cellist and pianist. This new work was recorded as an EP and copies will be available after the show. Doors open at 7pm, performance begins at 7:30pm.